Norn Minakami Ski Resort (ノルン水上スキー場) is one of the closest Ski resort located in Gunma Prefecture. There are 5 different courses. The altitude of the highest hill is 1,220m from the sea level, and the longest course is about 2km long. There are many facilities for both experts of Ski and Snowboarding. Open time: 7:00 to 22:00 to around the end of March. Closed at 16:00 in the Lastweek of March. One day: 4,500 JPY for Adult, 3,600 JPY for Kids, 4,000 Senior. 5 Hours: 3,900 JPY for Adult, 3,000 JPY for Kids, 3,400 Senior. Morning: 2,100 JPY for Adult, 1,800 JPY for Kids, 2,000 Senior. 1. use JR Joetsu Line to Minakami. There is a shuttle bus from JR Shinkansen, Jomo Station. 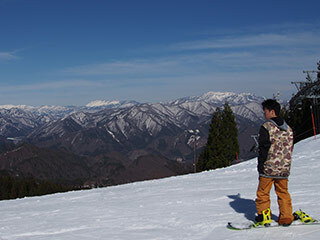 Norn Minakami Ski Resort is located in Minakami, Gunma Prefecture. It is one of the closest Ski resort from Tokyo. The access from the station is very comvenient. Also, many shuttle bus at Shinjuku. A: 840m long, angle 30 degree. B: 920m long, angle 26 degree. C: 870m long, angle 21 degree. D: 1,080m long, angle 14 degree. E: 1,30m long, angle 23 degree.